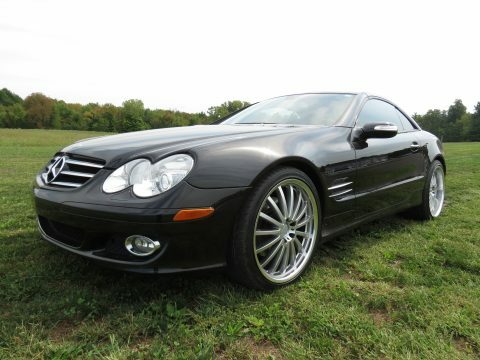 This 2007 Mercedes Benz SL550 is all luxury and power. This beauty features xenon headlamps, halogen front foglamps, single red rear foglamp, monochromatic red/clear rear lamp covers with dual intensity LED brake lamps, programmable daytime running lamps, deal heated power mirrors, dual aero-blade windshield wipers with infrared rain sensor, heated washer nozzles, and heated wiper parking position.Also included are 12-way power heated front seats, premium leather upholstery, center console with illluminated climate controlled storage, dual retractable cup holders, velour carpeting and floor mats, stainless-steel door sill trim, leather-trimmed steering wheel with controls, COMAND cockpit management system, DVD navigation system, exterior temperature gauge, oil level check, maintenance system, cruise control, tire-pressure monitoring system, power windows, SmartKey system, integrated 3-button universal garage door controller, hands-free communication system, automatic dual-zone climate control, 8-speaker Bose cabin surround multichannel digital sound system, illuminated and climate controlled glove box, auto-dimming rearview mirror, dual visors with illuminated vanity mirrors, automatic low-intensity environmental lighting, night security illumination, dual reading lamps, leather-trimmed shift knob, and a carpeted shelf behind seats with retractable luggage straps with locking dual enclosed storage compartments beneath luggage shelf.With only 81,693 miles, this beauty is ready for the road. Priced At: $49,000. Please feel free to call our transportation specialists at (518) 753-7446 or e-mail: tracy@rolisauto.com. We look forward to hearing from you!